While we’re wading through the cold puddles of late December, let’s check in on the climate front. And if you want to know why it’s so hard to take global warming seriously, take a look at the chart below. 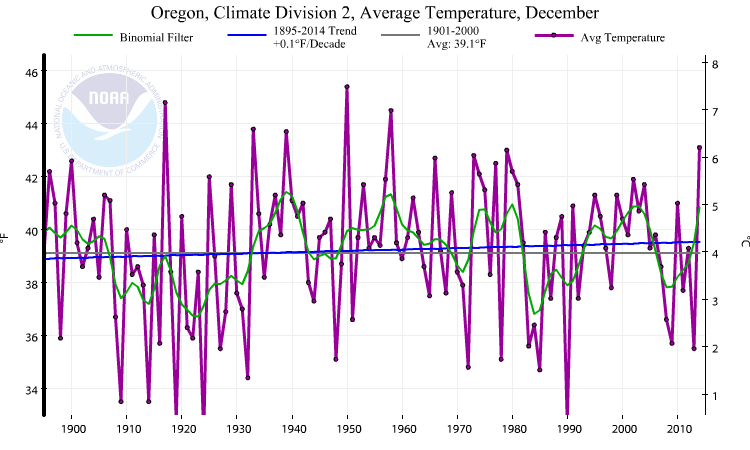 It shows average temperatures for the Willamette Valley for December going all the way back to 1895. See any warming there? Any indication of climate change? The climate may be changing everywhere else, but where we live it’s not, at least not in December. The table is from the climate monitoring website maintained by NOAA. The agency says that over the period from 1895 through now, the average daily temperature has risen by one-tenth of one degree Fahrenheit per decade. They do the arithmetic and that’s what it shows. But the actual variation from one December to the next, as graphed by the agency, seems to show a periodic fluctuation where Decembers are warmer than usual every 30 or 40 years or so. And in recent years, Decembers were often cooler than they were in the preceding decades. NOAA’s climate monitoring site is of interest in other way as well. It refers to a residential energy demand index. And it makes the point that as the climate becomes a little milder in the winter, residential energy demand drops. In November, for example, the average high temperature across the contiguous United States was 2.6 degrees F above the 20th century average. And based on the agency’s index, the demand for energy during this November was 68 percent below average and the fourth-lowest since 1895. That’s a lot of savings in the nationwide bill for heat. 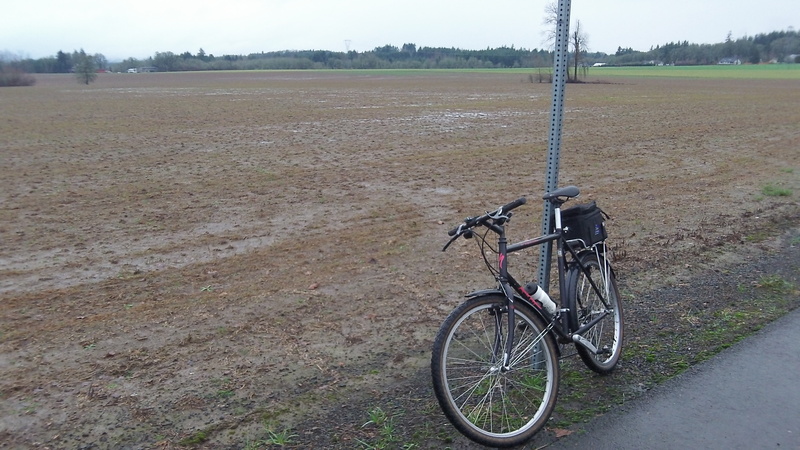 Glad there was no snow on the valley floor Sunday; it made cycling easier. Ahhh, statistics. Sometimes the answer you show is the one that fits your need. Had a site manager who insisted that folks read and apply “How to Lie with Statistics”. Actually this is a highly informative piece of info. The “olive” line is the grand average for the period. The blue line supports the thesis. Regardless, our part of the marble isn’t too affected. The bare ground in Glacier National Park was depressing 2 years ago. The signs marking the retreat of the foot of Exit Glacier made a body think. As to whether the trend is natural or human-activity-caused, likely none of us currently alive will live long enough to find the answer. There are many periodic factors that affect our climate and cause the “squiggles” in the purple trend. So the real question — how much of the variation is human-caused? Don’t know enough to know yet. The TQM guru Dr. Deming would look at the graph and conclude–it is just random data–no pattern here–nothings broke so nothing to fix. But our political class have never heard of Deming and don’t know any of his principles of determining whether a process in in/or out of control. Tom, Deming’s work dealt with structured measurements of single, specific activities. In this case, we have data which may have been aggregated from multiple sources. There are likely multiple causes at play as well –circulation in the Pacific (surface and subsurface), a volcano or two, etc. We know from geological record that heating and cooling have occurred cyclically. What we don’t know is whether current weather patterns are simply “noise” in a normal pattern, or a deviation. Deming’s followers could likely devise a wider application of the principles. The point I make is that there is nothing but much variability in the data. We have been told over and over that the data shows a troubling increase over time. The fact is the data does not show that—remember that it takes at least 7 continuous data points to show a trend. meaning a consistent average over time with shrinking variability. For example auto miles/gal. Multiple inputs–tire pressure, brand/octane of fuel, acceleration freq, oil viscosity, temperature are likely contributors. Collect the data and you’ll likely find the controlling inputs. Too bad we didn’t meet professionally years ago. The discussions would have been interesting. Rather than take up Hasso’s bandwidth, I suggest that we stand down. I leave with two thoughts — Earth’s life-forms thrive in a very narrow thermal band when considered on the scale of the universe; Fourier analysis is applicable if the data cover both the longest period and the highest frequency. Whatever heating energy savings realized in a warmer winter are likely to be offset by a similar increase in air conditioning energy increases in the summer. In fact, my electricity bill records show that August 2015 took more cooling energy than any August in the past 8 years. I must admit, though, that part of the increase was due to several days of poor air quality (forest fire smoke) which resulted in not being able to open the windows in the morning to use ambient cooling.